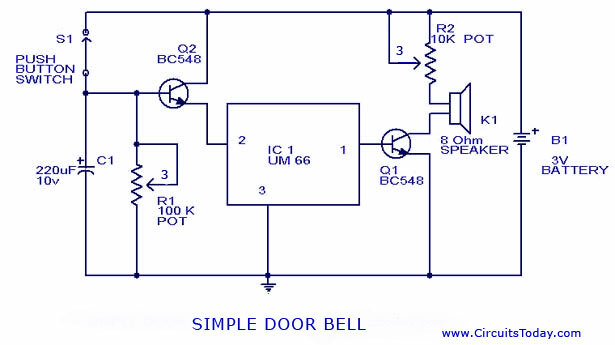 The main objective of the doorbell circuit is to convert electrical signals (input) into audio signals (output) with a single press of a switch. The circuit given below is a modified version of the Melody Generator Circuit, whose link is given above. In the previous circuit you had to keep the switch manually pressed for making the IC play the full music. Here if once the push button is pressed CapacitorÂ C1 is charged and the transistor Q2 will keep the IC playing the music till it ends. The time for the IC to play depends on discharging time of C1 which can be set by R1. Set R1 to select your time, whether full tone or a part in one press. Transistor Q2 drives the speaker. 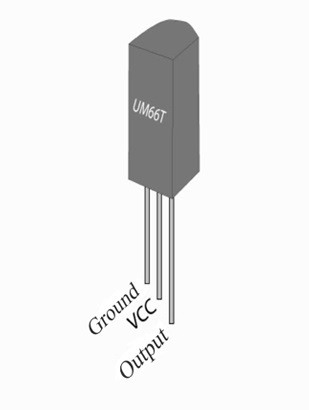 Pin 1 of UM66 is connected to the base of Transistor Q1 (BC548), so as to amplify the signal to drive the 8 Ohms speaker (K1). The IC UM66 is a melody generator CMOS IC and can be found in sound generating objects like doorbells, musical toys for kids, telephones, intruder alarms and so on. The IC has 3 pins with terminals GND (1), Vcc (2) & Melody Output (3). The tones are generated by the corresponding electrical signals at Pin 3. The IC works on a supply voltage range of (1.5-4.5) Volts. This IC can be used in small circuits as it consumes very less power. The IC will reset after a tone is played, and will start playing from the beginning. All you have to do is reset the IC using Switch S1. The IC does not require any new components to generate the audio signals. IC has a beat & tone generator that is already built inside. The time base for it is an in-built oscillator. The tone generator produces a particular frequency, that is the oscillator frequency factor. The beat generator has 15 different beats, out of which four of them can be selected. The tone is generated using a 62 notes ROM. Out of this 4 bits control the scale code and 2 bits are used for the rhythm code. Different tones are available with different versions of the IC. Some common tones are “Jingle all the way”, “Santa Claus is coming to town”, and “Christmas song”. Do not give more than 4.5 V to UM 66. POT R2 is not necessary and can be bypassed. But if included you can set the loudness. how can i build this circuit on breadboard?please send reply show build circuit on breadboard or pcb. how can i build this circuit on breadboard? please show circuit on breadboard and on pcb also. What does the meaning of 3 on 100k & 10k pot. What value should I place in these two pot. how does R1 vary the time of charging of c1..
an any one help me ????? Hi Kiran see the notes kindly delete R2 and connect speaker to + direct, without pot. i saw the circuit it was good but i want to make reverse horn of car.please send me a simple and with loud sound because i am just a beginner of electronic. i made the circuit but from the 100k pot fire sparks are coming out.please can you tell me whats wrong in the circuit. Hi Nishanth you are right Pin no1 common, 2 supply and 3 output. This IC is a basic CMOS ROM with built in melody, which is prefixed and cannor be changed. HOW DO I WIRE THIS BELL SYSTEM. “A” BELL “AB” BELL “BC”BELL “A” PUSHBUTTON “AB” PUSHBUTTON “BC” PUSHBUTTON ONE MASTER PUSH BUTTON WHEN PRESSED TO RING ALL THREE BELLS. I can’t find UM66 in Singapore. I’d appreciate your recommendation of an equivalent chip that can simply replace it in the same circuit. Thanks in advance. i feel there must be description over the diagram for better understanding. if it is their i didn’t find. this circuit has very low sound…! have you adjusted the potentiometer R2?? Good Info , thanks for sharing..!